It is a group of wadaiko that is admired in the world as “The Japanese entertainment” for non-verbal entertainment at the top level in Japan. The group has been seen by seven million spectators in 500 cities in 24 countries around the world. In 2015, the production team, which was nominated in four (4) divisions of Broadway Tony Award, gathered again, and in 2016, the group obtained a great success in an Off Broadway public performance in New York City. 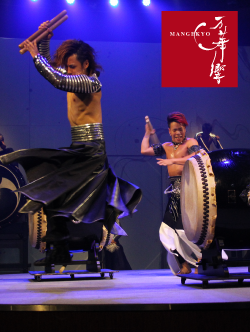 Currently, the activities of DRUM TAO are attracting attention around the world, and are noted in the media too.